From Monday through Thursday, we can expect mostly fine weather for the North Island, apart from isolated showers possible over Gisborne and Northland and a few inland afternoon convection showers from Taranaki across to Waikato. Temperatures are expected to be about average for this time of year, although around 4-5 degrees above average about the lower North Island. 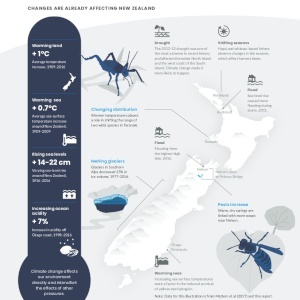 There is mostly fine conditions over the South Island until Thursday, apart from high humidity air along the east coast, resulting in low cloud with a few drizzle patches on Tuesday. In addition, isolated afternoon and evening heat showers are possible about inland areas today through to Wednesday, with showers less likely on Thursday. Much of the South Island can look forward to above average temperature for the week ahead. Reefton, can look to a maximum of 27C both today and Wednesday which is eight degrees above average. The downside is that the nights are expected to be warm as well as humid, with centres such as Wanaka, Dunedin and Alexandra seeing overnight minima around 15C around eight degrees above average.